December 16, 2014 by Venky. Montra Tour of Nilgiris – 2014 – Day1 – Bangalore to My’sore’! The pampering of the riders on the Montra Tour of Nilgiris 2014 started with 5-star exuberance at the palatial Leela Palace, Bangalore, where the pre-tour briefing and flag-off was held. After a sumptuous breakfast a brief pre-tour briefing we were flagged off by the guest of honor, Ashwini Nachappa, who was once an accomplished track and field athlete. Once we got out of the palatial hotel, we had to ride through early morning traffic to get out of Bangalore. We rode about 18km to get to the entrance of NICE road where we had to wait a while until the officer in-charge of letting us through came back from his morning coffee break. By the time we got on the NICE road, after waiting for about 15 minutes or so, most of us were raring to go. The expressway always gets the legs warmed up for the ride ahead. Vivek Radhakrishnan got a train going with a few of us and after a while the four Dutch riders took up the pace making. The long train got split into 2-3 smaller ones after a few minutes and we covered the 15 km of the NICE road stretch at about 41 kmph. Seeing such speeds is a good ego boost for the roadie even though it was on fresh legs and was mostly downhill. Once the legs got warmed up on the NICE road, even after exiting into a much narrower and more traffic bound Kanakpura road, the pace kept going. By now, 2013 Tour of Nilgiris champion, Nils Eigil Bradtberg joined the group and got into the front. Once he got to the front the pace picked up further. We were a bit relieved when he finally decided to let others do the pace making after drilling it at the front for a while. Dipankar Paul, the multiple Ironman, took to the front and kept the pace going. After a while I took the turn at the front and tried to keep it going. The first day legs meant I was doing alright and for that stretch of 41km we were averaging about 38kmph. We rolled into the first support station at 75 km mark quite early(about 9am). After a quick refueling, we rolled on towards the 2nd support station which doubled up as the start of the competitive section(CS). We rode at a sedate pace for the 25km towards the CS. The competitive section for the day was a flattish section of 16 km from Halaguru to Malavalli. There are three or four slight inclines which makes the course slightly rolling. There was a slight headwind to make sure that it is not too easy to see high average speeds. Riders were sent off with one minute gaps in between. I started behind my Spectrum racing teammate, Vicki Nicholson. I did the rookie mistake of starting off too fast in a time trial and realized too late that I was mashing the big gears at a low cadence. The legs took a beating and the watts began to dip. Probably the drilling at the front early in the day didn’t help too. But, instead of recovering and spinning to get back on track I gave up too soon and settled to get a half decent tempo workout in. Well, anyway that was my list of excuses for my bad performance. Looks like there won’t be any surprises with respect to Nils defending his TFN title. But the rest of the field looks quite close to each other. 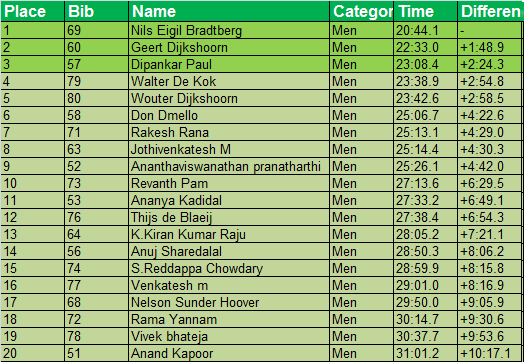 Dipankar Paul made into the top 3 while one of the Dijkshoom brothers, Geert Dijkshoom finished 2nd at 1:48 down on Nils. 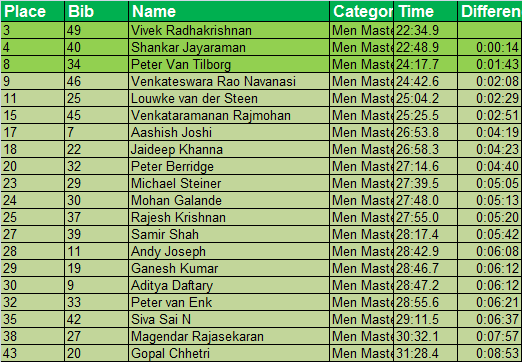 The competition in the master’s category is quite intense with Vivek and Shankar 14 seconds apart at 1st and 2nd respectively. Peter Van Tilborg finished 3rd for the day. Interesting to see how it unfolds. The defending champion of 2013, Vicki Nicholson continues to dominate category this year too with an eight minutes lead over the next participant, Namu Kini. After the competitive section we still had 70km to ride and since it was only 12pm, we had decided to skip the pasta lunch at the support station and get to Mysore as quickly as possible. We went through some beautiful terrain via Saraguru and Narsipura. Apart from a couple of stretches of bad roads that spanned about 10 km overall, we had decent roads that went through beautiful paddy and ragi fields. We’ve let Vivek and Nils go on their own and spun easy to make steady progress towards Mysore. Since we were not going through Bannur we had to miss the delicious mutton biryani and had to settle for eating at a veg restaurant called Malgudi, some 6km from our hotel. It’s just My’sore’ I’m already Sore! We reached KVC hotel at about 3:30pm completing the 187km ride. The long distance and the bad stretches towards the end made the going difficult for quite a few riders and they kept rolling into the hotel till about 6:30pm. Many started complaining about sore bums, shoulders, arms and a lot more already and it is just the first day of the tour. Tomorrow’s Kalahatty climb after 100km of ride is going to be a big challenge. There is also a competitive section of 12km before the fight on Kalahatty for King/Queen of Kalahatty begins. Last year’s finish % was 40% on Kalahatty. Will riders be more prepared this time? Will more riders be able to complete the stage within the cut-off time? We have to wait and watch as it unfolds tomorrow. Lost In Transit: TFN first timer owes(Anubhav’s of Anubhav)! Seeing a hill for the first time in life? The longest ride in a day? The usual ride distance for an year done in a week? There are a variety of first time TFNer troubles we get to see at Tour of Nilgiris. But Anubhav Karmakar’s troubles started even before he got on a bike. His first TFN almost turned out to be a non-starter. Anubhav was in Switzerland for work and bought himself a nice road bike especially to ride TFN. He landed in Hyderabad on 15th Dec and found that neither the bike bag nor his other baggage reach Hyderabad. He had to run around to get his old bike ride worthy again; had to buy everything from underwear to basic toiletry and pack everything and take a bus to Bangalore that very night. He managed run pillar to post to arrange everything and make it to the start line by taking the overnight bus to Bangalore from Hyderabad. But with all of one 40km ride in the last two months, which resulted in him earning a ticket for riding on the Swiss highway, be enough to see him through the tough tour? Let’s wait and see! All the best, Anubhav. A few other photos from day one are here. Also read the account from fellow blogger Abhishek Tarfe on Velocrushindia. Day 4: Ooty to Palakkad: One world to Another!! Previous The Addiction That is TFN! Why I Look Forward to the Tour of Nilgiris Every Year! Next Montra Tour of Nilgiris -2014 – Day 2 – The Madness of Kalahatty! Following with great excitement and feeling very very far away from all the fun. No Bannur mutton, but at least you didn't pass through Bannur and not stop!! Great account of day 1. I'm looking forward to reading this day after day Venky! We are following this Venky, keep them coming ! Nice one….looking forward for the blog post, every single day….thank you. Venky – please include the average speed also in results and save us some math. 🙂 If you can get hold of wattage of top guys please include that as well…you might be climbing kalahatti now all the best..